Born: Near Paris, 25 December 1933. Education: Studied at the École de la Chambre Syndicale de la Couture Parisienne. Career: Began selling sketches to Balmain and Jacques Fath; sketched for Marc Bohan and Givenchy; became chief designer for Nina Ricci, from 1963; freelanced for London's Germaine et Jane, Jean Baillie-Itemcey, and Chloé. Awards: De d'Or, or Golden Thimble, for best couture collection, 1987; National Knight Cross Badge, 1995. Lambert, Eleanor, World of Fashion: People, Places, Resources, New York, 1976. McDowell, Colin, McDowell's Directory of Twentieth Century Fashion, New Jersey, 1985. Skrebneski, Victor, The Art of Haute Couture, New York, 1995. "Ricci Cruise," in WWD, 6 July 1990. "Gianfranco's Couture Chic Revs Up Dior," in WWD, 29 January 1991. Deeny, Godfrey, "Ricci's Pipart: Staying Power," in WWD, 26January 1995. Menkes, Suzy, "Divine Madness: Galliano True to Himself at Dior Debut," in the International Herald Tribune, 21 January 1997. "Alta Costura vs. Prêt-â-Porter," available online at Tendencia.com , www.tendencia.com 20 August 2001. "Gerard Pipart," available online at International Culture Festival, www.sh.com , 20 August 2001. Gérard Pipart, designed for the house of Nina Ricci's 1995 collection. Gérard Pipart, designed for the house of Nina Ricci's spring 1965 "Java" collection: linen with a shantung bodice. 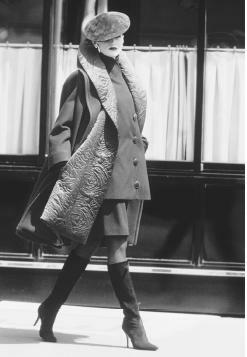 Before the age of 30, Gérard Pipart had become the most vital women's ready-to-wear designer in Paris. His clothes were already great sellers abroad. He made his mark with snappy, colorful sportswear, well-tailored, detailed, and with a deceptively casual simplicity that only good seams and a fine cut can guarantee. He became known for his inspired use of fabrics, as he skillfully manipulated every material he chose into amusing, wearable chic. His work as a freelancer at Chloé and other houses gained him widespread visibility, and he was hired by Nina Ricci in 1963 to replace designer Jules-François Crahay. His move to Nina Ricci's Haute Couture Studio was closely watched, and indeed, the young, fresh-faced designer brought new life to Ricci with his lively, youthful designs. As a young designer, Pipart considered Balenciaga an important influence and greatly admired the designs of Norell. His background as an assistant at Balmain, Fath, and with Marc Bohan at Patou gave him a solid grounding in haute couture before he became a bright young star in ready-to-wear and then back again to couture. His couture collections have included elegant daytime wear, sumptuous coats, extravagant evening looks, furs, and bridal wear. Early collections focused on supple lines and a fit close to the body without being overly confining, and his clothes were praised as "never, never too haute." Later collections investigated the long, languid lines of the bias-cut dress, played with loose, theatrical capes, feminized the culotte for daytime wear, and toyed with 1940s and 1950s retro looks. His penchant for no-holds-barred glamor can be seen in evening dresses of frothy chiffon and bright, opulent taffeta, long-waisted and cinched, with high trumpet sleeves and luxuriant folds billowing to the floor, or exquisite embroideries requiring hundreds of hours of work. He dared to defy the "bride wore white" norm with his design for a Provençal-printed, multicolored mélange of a bridal dress, wrapped at the waist with a wide cummerbund, topped with a short jacket splashed with rhinestones. Fur trim, feathered hats, ruffles, lace, long gloves—Pipart has never shied away from a certain feminine, Parisian elegance in his designs and use of accessories. His 1990s collections included bright, crisp cruise wear, including short skirts and swimsuits with matching floor-length skirts in shades of hot orange, fuschia, and kelly green. Fabrics ranged from cotton pique and satin to embroidered linen and cotton jersey, affording comfortable and cheerful warm-weather looks. Other collections have highlighted pleats, with pastel skirts under pleated safari jackets for day and long iridescent taffeta dresses for evening. Pipart also received praise for his white linen suits and two-toned, draped crêpe dresses. Not really an innovator, Pipart's strength at Ricci has been his ability to take stock of fashion trends throughout each season and then to imbue them with freshness and youthfulness without sacrificing his unerring sense of French good taste. Pipart earned much respect in the early 1990s for his three decades as Nina Ricci's couturier designer of classic, ultrafeminine costumes. Reminiscing of the mid-1960s, he recalled, "I was only thirty, young and full of new ideas, so it was all pretty different and I had to adjust." He numbered among his fans the queens of Thailand and Norway, Grand Duchess Josephine-Charlotte of Luxembourg, Marcella Perez de Cuellar, and Mai Hallingby. Looking back with pride in his staying power, Pipart admitted that he was initially hesitant to throw in with Ricci. Of the flux of the fashion world, he remarked, "I'm amazed I stayed so long. When I arrived everyone was predicting the death of couture, so I was keen to get in for what were meant to be the final few years." Marking his 30th anniversary, he showed a collection of multicolored caftans and harem pants, ostrich plumes, and pleated column shapes with bustiers or lace bodies, his homage to impressionist painter Eugene Delacroix. He stated his objective: "My goal is to make a woman beautiful. In the evening, it's a great pleasure when a woman makes a man happy, hopefully in my clothes." By 1997 the irrepressibly romantic Pipart was off in poufs of pink taffeta. Of his elevation of women into birds of style, Suzy Menkes of the International Herald Tribune remarked, "His polished technique is at its best in floaty evening dresses as fine as a mille-feuille pastry and twice as sweet."